Not only do we have this weekend's potential to consider, it looks like next week could offer something significant as well should things fall into place. This period has been quite busy on the ensembles, and operational model guidance across the board. 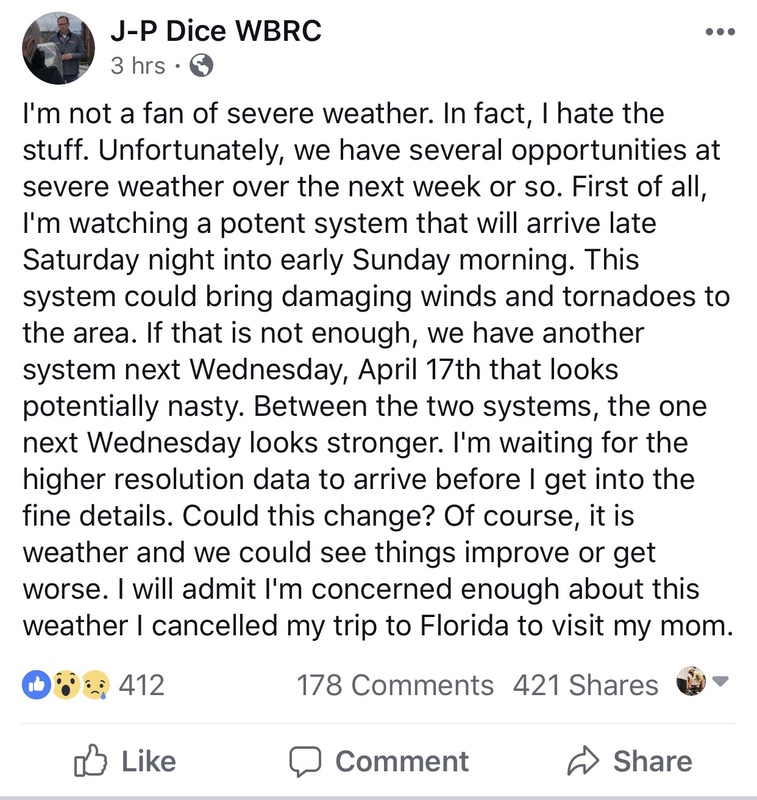 Couldn’t figure out how to edit but this is from JP Dice’s FB page. Decided to screenshot instead. Next Wednesday is...FLAT. OUT. UGLY. GFS and especially the Euro are significant severe wx events. Let’s get through Sunday first. Oh yeah. Wow. Next Wednesday looks uh...problematic. Euro has a 978 mb low sitting over the upper Midwest. I know where we will find @Lori. Does your WIFI reach through the storm shelter? I see there's a threat on the 17th. Where do y'all think will be under the gun for that day? Is TX? Too far out to know for sure. But likely at this point from the Great Plains to the Lower Mississippi Valley. We should,be able to narrow it down once we get past Sunday's threat. It looks like my birthday trip to Chattanooga is not going to happen this Sunday. Anything for the Tennessee Valley next weekend, Easter weekend? Weekend of the 20th looks clear for the SE but I’d give it a couple more days as these things change. Think about this: April 3, 1974 was a Wednesday; April 8, 1998 was a Wednesday; and April 27, 2011 was a Wednesday. Probably the three biggest tornado events in Alabama history (certainly two of them were) all happened on Wednesdays. 11/15/1989 Huntsville rush hour F4 was on a Wednesday as well. Wednesday, May 25, 1955 - Two F5 tornadoes with 100 deaths between them in Udall, KS and Blackwell, OK, and an F4 near Aberdeen, TX. Wednesday, April 8, 1999 - Three violent tornadoes in Iowa.